The beautiful mountain town of Canmore is situated on the Bow River between Calgary and Banff on the eastern edge of the Canadian Rocky Mountains. 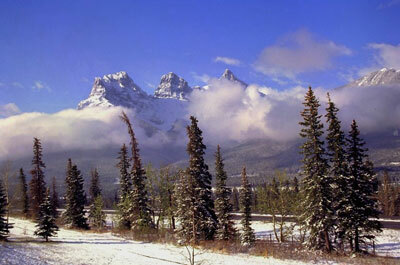 The Three Sisters, Canmore's most recognizable peaks, tower over the little town located in the valley. This small community got its start in 1884 and due to the Canadian Pacific Railway's need for coal to fuel train travel through the Rockies, Canmore had its first coal mine by 1887. It was named Canmore after Malcome III Canmore (meaning 'big head'), King of Scotland from 1057 to 1093. With the discovery of the hot springs in Banff in 1883 came the need to protect natural environments in Canada. This resulted in the Banff Hot Springs Reserve created in 1885. Two years later this reserve was expanded and given the name Rocky Mountain Park. This was to be Canada's first national park, second in North America only to Yellowstone National Park. The park boundaries were to change a number of times in the years that followed and Canmore found itself within the park boundaries for a number of years. With pressure growing not to have mining within park boundaries, new regulations were drawn up. In 1930, the National Parks Act was passed and Banff National Park was born. Now outside the park boundaries, Canmore's importance as a coal-mining town grew as other mining sites in the mountains closed down. Canmore's 'independence' from the national park would impact its future in ways many could not have imagined. Canmore continued to thrive as a mining community until the 1970s when demand for coal fell. This decline in coal use led to the closing of the Canmore mines. Many people lost their jobs and moved away and the future of this once coal-mining town was uncertain. 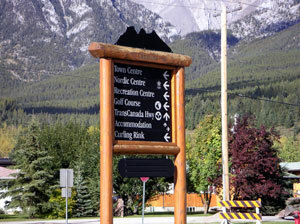 Then came word that Canmore would be hosting the Nordic events of the 1988 Calgary Olympics. This gave Canmore the international exposure that would lead to the beginning of two new industries - tourism and land development. 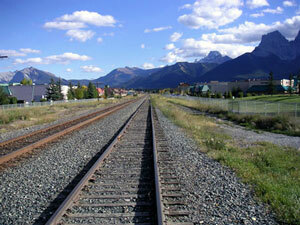 Today, Canmore is home to approximately 11, 000 people, with a third of these part-time residents. With the "right to reside" regulation of Banff National Park (which prohibits anyone not employed in the park from living in the park), Canmore became the mountain get-away that was accessible to anyone - providing the funds were there. Europeans first fell in love with this mountain town (Swiss influence is noticeable), followed by the Americans, Japanese.... As a result, it is very difficult to find temporary or permanent housing in this booming market. 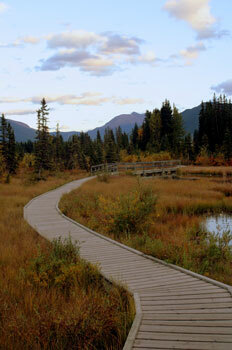 Canmore and the neighbouring Kananaskis have become very popular for people all over Alberta. On weekends the 'car parade' from Calgary to Canmore and back on Sunday night it noticeable as people try to flee the city. 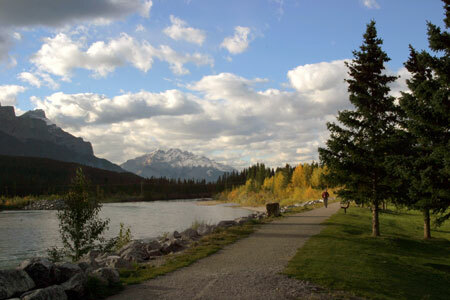 Canmore is also home to many athletes who come to train in the summer and winter months. With Canmore located right on the Trans Canada Highway, and only an hour and a half from the Calgary International Airport, it is easy for anyone to come and make use of this "backyard playground" provided by Mother Nature herself. There are countless activities that are available to people who love the great outdoors, are interested in the arts or just want to sit back and enjoy some great entertainment. There are a number of fascinating festivals and events to take part in around this little mountain town including the Rocky Mountain Ski Challenge, Mozart on the Mountain, Canmore Children’s Festival, Canmore Highland Games, Canmore Folk Music Festival, Rocky Mountain Half Marathon, Festival of Eagles, ArtsPeak Arts Festival, Vic Lewis International Band Festival, Canmore Ice Climbing Festival and 24 Hours of Adrenalin to name a few. Canmore has become one of the most desirable places to live and considered a 'mecca' for outdoor enthusiasts. The town itself has changed a lot since the early 90s, and it doesn't look like it is going to let up anytime soon. Limitations on development have been set, however, and following the completion of projects like Three Sisters Mountain Village, Spring Creek Mountain Resort and SilverTip, the town will have likely reached its cap of about 35,000 inhabitants. Land in the area is limited and this too continues to push up prices. I wonder what the old miners would think about today's prices?